One thing I do to help our homeschool run more smoothly is to create and use detailed lesson plans. Weekly lesson plans tell me what I need to teach and show my children what assignments they need to complete throughout the week. Creating lesson plans using Evernote is quite simple. All you need is an Evernote account and all of your homeschool books and materials. Once lesson plans are created in Evernote, they can be accessed across multiple devices at any time. This is especially helpful when we’re away from home and one child has to wait for a sibling to finish a private lesson. As long as we pack the schooling materials we need, I always have my lesson plans with me and can teach while waiting for a child to complete that class or activity. Once logged in to your Evernote account, create a New Note. You can create a New Note by clicking the + sign. 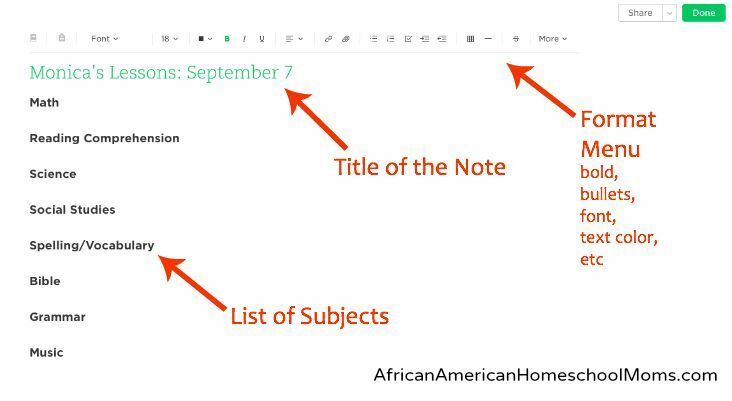 A new note will appear and you can begin creating a lesson plan template there. Name your new note. Each of my children has her own personalized lesson plan, so I title each note using the child’s name and lesson plan start date. This makes it easier to find the plans later on. Create a list of the subjects you’ll be teaching. Then, add them to the lesson plan template. I use the format menu to make the subject names appear in bold print. This makes it easier for my children and me to read the lesson plan. List weekly assignments using bulleted points below each subject. 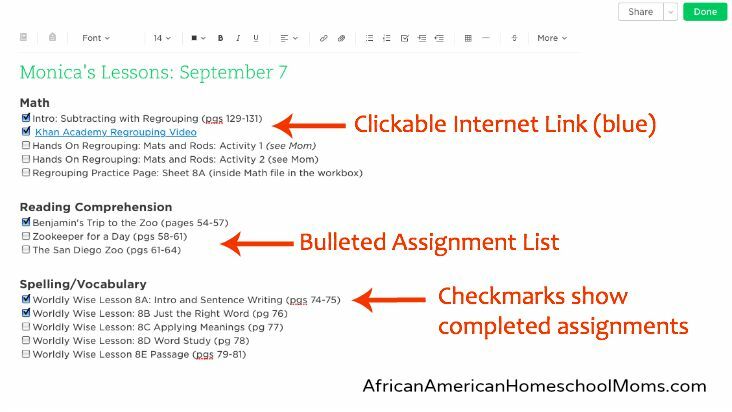 I prefer to use a checkbox as my bullet, so my children can check off assignments as they complete them. When I list assignments, I include pertinent information such as the book title, page numbers, selection title, internet links, etc. Save the note and file it away into a notebook. Once all the assignments have been added, you’ll need to save the lesson plan. Storing the lesson plans in a notebook keeps lesson plans neatly organized. This is especially helpful if you’re doing lesson plans for more than one child because each child can have his own Lesson Plan Notebook. In addition, notebooks help you keep track of the year’s assignments and serve as an awesome digital record of completed work. I never include days of the week in my weekly lesson plans. Our schedule is a very fluid one. I’m working with three children, so things can change quickly during the course of a week (sickness, rescheduled activities, etc). Therefore, our weekly plans to have offer flexibility and enough room to include last minute changes. This type of schedule allows my children to work ahead if they wish and allows them to slow down if they need to without being held hostage by a day of the week. Some subjects are taught only a few times each week. Most subjects contain five bulleted points, one for each school day. However, other subjects are only taught a few times a week (for us that includes Reading Comprehension, Social Studies, and Science) and therefore only have two or three bulleted points. I give my children the flexibility of completing the three assignments when they prefer to do so. This could be three consecutive days, every other day, or however they decide. I give my children printed copies of their weekly lesson plans. Though I could give my children their own Evernote accounts and share the lesson plans with them, I find there’s no need for me to do so. On Sunday nights, I print copies of the weekly plans and place the plans inside their workboxes. The children check off assignments as they complete them and I do the same within my Evernote account. Creating a new set of lesson plans is easy. After a week of lessons is done, I can easily create a new lesson plan for the upcoming week. I just need to create and name a new note and then copy and paste last’s weeks information into the new note. From that point, I edit to include a new set of assignments. If an assignment from last week was not completed, I leave it in the plan and adjust the additional assignments. We’re fortunate to homeschool during a digital age, so homeschool moms can use technology to create awesome lessons plans. 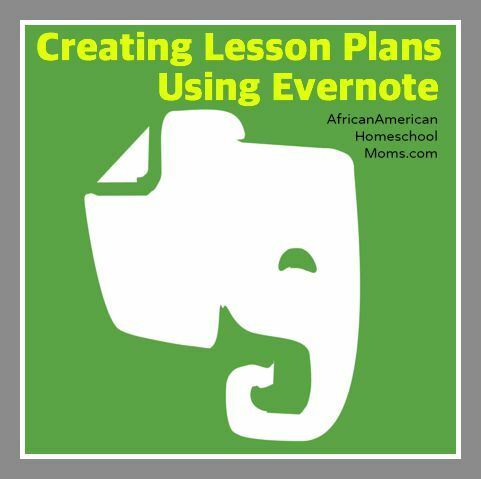 Creating lesson plans using Evernote is quick, easy, effective, and child-friendly. If you have any questions about this post or how else I’m using Evernote, feel free to leave a comment or send me an email using the Contact Form.